A decade on: What's the verdict of America's era of easy money? At least 278 people have been detained in the French capital ahead of anti-government protests called by the so-called "Yellow Vest" movement in opposition to a rise in fuel tax, the police said on Saturday. France was bracing for the renewed demonstrations with nearly 90,000 security personnel on the streets. Some 8,000 officers and 12 armoured vehicles were deployed in Paris alone, where shops were boarded up and sites like the Eiffel Tower and the Louvre Museum closed. A police spokeswoman said that the number of arrests could rise over the course of the day. Most of the arrested were detained for being part of groups likely to carry out acts of violence or for being in possession of objects that could be used for that purpose, the spokeswoman said, adding that they could be released once the relevant verifications were made. 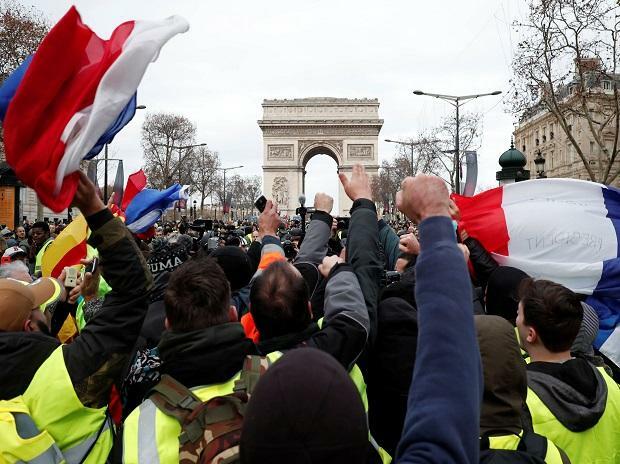 The "yellow vest" movement began three weeks ago in opposition to a rise in fuel tax and planned increases in taxes on polluting forms of transport, but it has since evolved into broader demonstrations against the government of President Emmanuel Macron. Ministers say the movement has been hijacked by "ultra-violent" protesters. Last week, thousands wearing high-visibility yellow jackets clashed with the police in Paris as demonstrations escalated into anti-government violence. The French government later suspended its plans to hike fuel taxes following the huge public backlash. The French press has billed the unrest as Macron's "greatest political test" since taking office in May 2017. Protesters were also demanding higher wages, lower taxes, better pensions, easier university requirements and even the resignation of the President.